Definition - What does Tadasana Urdhva Hastasana mean? Tadasana urdhva hastasana is a variation of tadasana that provides a full body stretch and is commonly used in warm-up sequences like Surya Namaskara. From Sanskrit, tada means “mountain,” asana means "pose," urdhva means “upward,” and hasta mean “hand" (urdhva hatasana can also mean "upward salute"). 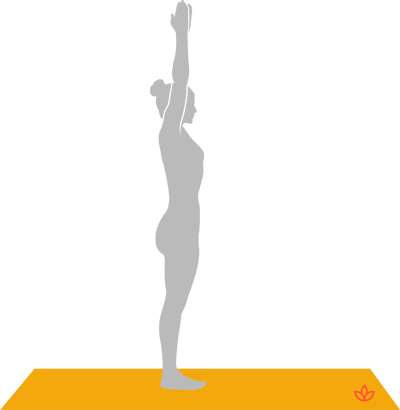 From mountain pose, the arms are raised above the head with the palms of the hands facing each other either apart or pressed together. The drishti is either forward or in the direction of the hands. Tadasana urdhva hastasana helps with circulation, tight shoulders, toning of the thighs and aiding in digestion. This variation of tadasana can also help with anxiety, stress and tiredness. This full body stretch also helps to energize the body and prepare the mind for a yoga practice. By performing this pose, the practitioner can relieve fatigue, anxiety and naturally activate energy in the spine and through the solar plexus. The alignment of the spine in this pose also helps align the chakras and bring awareness to the subtle body.